Nicotine/Caffeine. Nicotine and caffeine both raise your blood pressure temporarily. It’s best to refrain from smoking, chew, coffee, tea, sodas, and energy drinks a few hours before the examination. Replace caffeinated drinks with water to stay hydrated. Tired. Tired, weary, stressed? Your blood pressure is likely to go up. Get rested before the examination and leave plenty of time to get to your appointment. Get to your appointment early so you have time to sit and relax. Temperature. Blood pressure tends to increase when you are cold. If you’re at the doctor’s office and the room temperature is “chilly” to you, be aware that your blood pressure readings may be higher than expected. Dress to stay warm. Glass of water. Drink a full glass of water before you get to your appointment. This will help calm your body as well as prepare you to give a urine sample. Full Bladder. Your blood pressure is lower when your bladder is empty. Ask the doctor to perform the urine test prior to the physical exam. Emotional State. Stress or anxiety can cause large increases in blood pressure. If you are thinking about something that causes you to tense up or become stressed whilst having your blood pressure taken, the levels could significantly increase. While your blood pressure is being taken, be quiet and think about something far away that makes you feel happy and relaxed. Talking. If you are talking to the examiner while having your blood pressure taken, studies have shown that your systolic blood pressure measurement may increase 10 to 15mmHg. Be comfortable talking beforehand, especially if you’re chatting about something that makes you feel happy or relaxed, like a sport or hobby, or a vacation. Then be quiet during the blood pressure reading. Restricted Breathing. Holding your breath because you are nervous will raise your blood pressure. Breathe slowly and deeply like the doctor tells you to when listening to your heart with a stethoscope. Breathing slowly and evenly will help your body to relax. Arm/Back/Feet Unsupported. When having your blood pressure measured, you should always be seated in a comfortable chair, legs uncrossed, with your back and arm supported. If your back is not supported, your diastolic blood pressure measurement may be increased by 6 mmHg. Crossing your legs has shown to raise your systolic blood pressure by 2 to 8 mmHg. The positioning of your upper arm below your heart level will also result in higher measurements, whereas positioning your upper arm above your heart level will give you lower measurements. These differences can increase/decrease your systolic blood pressure 2mmHg for every inch above/below your heart level. Blood Pressure Cuff Used Over Clothing. Studies have shown that clothing can impact a systolic blood pressure from 10 to 50 mmHg. When having your blood pressure measured, the cuff should always be placed directly on your arm. Get Your Spine Aligned! Pain or physical discomfort tends to raise blood pressure. Several studies have shown that chiropractic adjustment will lower blood pressure after the correction is delivered. 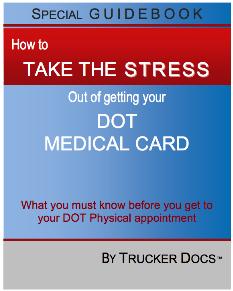 Thanks to Trucker Docs™ expert panel doctor Michael Impaglia, DC for contributing this article. You can get your DOT physical with Dr. Michael Impaglia in Buffalo, Depew, NY. The doctor is on your side so let him/her take care of the examination! The best thing you can do is go to a happy place far away and breathe slowly, and deeply, and evenly, in and out. It does help. Just went to do my 2yr DOT physical recertification and the CME said I could only renew for 1 yr due to taking Seroquel and trazadone which I’ve been taking for over 5 years. I also take Gabapentin. Had to get the extra documentation needed to pass. But now I only get it for 1yr and not 2 yrs as I have always gotten in the past. Confused…has DOT changed there term rule or did the CME make a mistake? The DOT/FMCSA is getting more strict and the examiners are at greater risk if something goes wrong. Examiners have the right to limit the length of a card due to any medical condition. Your examiner wants to keep a closer eye on your situation, we guess. No mistakes, just their judgement call. Hello, I want to start my trucking carrier and want to look into some companies to gt my CDL, My question is I had a heart attack back in January, would this prevent me from passing a DOT exam? or would I need something from my cardiologist to clear me? You will need documentation from your cardiologist. Medical release forms and a working prognosis with recent test results. I’ve been a driver for 25 yrs. In recent years, my issue has been passing with my BP. Again, hopeful that I’ll pass that, I wonder if I must divulge recently having been diagnosed with possibly Fibromyalgia? If not, must I divulge that I take a muscle relaxer, if I only take it when I’m not driving commercially? The fibromyalgia may not be a big issue, but the pain medications will be. Get a medical release form from your prescribing doctor explaining your situation. The CME needs to have all the available information to make a final determination. Leaving out pertinent information puts you and the CME at risk of losing your licenses. I had tia mild stroke January 29,2018 treated and held overnight for observation neurologist cleared me to go back to work with no restrictions, but when I went to renew my health card dr. said no driving for one year. I have class a cdl. what is up? FMCSA is strict on this due to re-occurance of another stroke. You may want to check into intra-state only driving during your wait period. Check with your local drivers license department to confirm. I live in Texas and my dot medical card expire on 03/19/2017 but i do not get paid until the 21st. can they give me a grace period for a few day, or what is the penalty if i wait those 2 days? Check with your states drivers license department for the best answer. I had cardiac stents in march 2005.I don’t have any problems with them and even went to Iraq in 2007 until 2010.I had my re-certification recently and the dr said I need a stress test.I was given a 3 month medical card.My insurance won’t pay and the dr told me the cost is between $2000 and $3000.Is the stress test a new requirement?He said all my vital signs were normal. Heart conditions that fall in certain categories would require a new stress test every two years. FMCSA passed those guidelines some years ago. my husband went to for his medical exam to renew his medical card. He did not pass the BP test….they waited a few minutes and retook it and it was 140/90…so he was happy…..but the doctor said it had to be constant so he did not pass him. Is that right? They gave him a prescription for BP and an extension on the card. They also went on and took a blood sample, which is not in the requirements, correct? I took my DOT physical yesterday, my heart rate was too high so they gave me a medical card good for 1 month. I have to go on blood pressure meds then within this month i have to go back to be rechecked. Do i wait until i get a new card before i take my CDL permit test, or can i take it now? I just took my DOT physical here in California. BP was 141/88 and I was failed. I also used my CPAP machine for 68% of the time according to the print out I used my CPAP machine for 68% of the time. 70% is required. So I failed that too. I was told there are no longer 90 day extensions on Cpap compliances so I can’t drive for 7 days and after 7 days must show that I used the machine more then 70% in those 7 days and then I can drive for 30 days and show the report again and if passed I get a 1 year authorization to drive. When did the NO 90 day license extension take effect,? Does it also apply to borderline high blood pressure? Is acceptable to lay down or recline for bp test during physical? Do the medical examiners check your medical/prescription history on a database? or do they just go by written form filled out by driver? They can check the data base. I was given a one year medical card due to alittle high blood pressure can I get a two year card next time if it is good. Possibly, if you are not taking any type of blood pressure medication or have not been on any medications before. The new FMCSA forms ask if you have ‘ever’ had, so if it was a one time high and no meds, then you could be OK.
Best bet is to watch your lifestyle and see if you can get it down by yourself. Check your blood pressure every couple of weeks, and have a real doctor check it, not one of the free automatic ones. Can a company require that you are only able to use a certain CME? All depends on the company policy. But in reality you have the right to go to any CME that is on the national registry. I would think that if the company is requiring and paying for the physical, then they probably are within their rights to select the place in which you will go. I have had this happen a few times and just followed the orders from the company as it was a pre-employment physical, and they were indeed picking up the tab. Blood pressure reading at the time of examination need to be 140/90 or less. If you are not taking any medications then you could qualify for a two year card. If there is a history of high blood pressure in the past, then the CME may hold you to a one year card. He really only wants to monitor your situation before signing off on a two year card. All of this is based on everything else being within normal limits. I took my physical in February. They used a machine that kept repumping and gave a slightly eleven ed pressure. I requested a manual pressure test which produced a reading of 140/90. The doctor failed me and issued a 90 day certificate because she said it had to be less than 140/90! My physician has increased my med but I am panicking servery and I am afraid. What is next? FMCSA guidelines require a 140/90 or better. As long as you are at those levels, you will be fine. You do want your pressures down below the guidelines recommended, and your card will be good for one year at the time. The three month card was for you to have your doctor reassess your meds and get your pressure below the cut-off. I’m a first time cdl applicant and I take clonazepam for social anxiety is that going to affect my obtaining a medical? Is that something that I need a release form for before I take my first physical? Thank you. Yes, get a medical release form from your doctors. The CME needs as much information as possible to make the final determination. If the condition is controlled and has been for some time, you may be OK. But make sure you can provide supporting documentation. recently due 2 high blood pressure reading i was given a 3 month card, now its back time 2 take the physical again and im on new meds to help control my blood pressure is it possible 2 get another 3 month card if my blood pressure is still at a high reading? No. You get a one-time 3-month card to get your blood pressure under control. The CME may take it under consideration if it looks like the new medication is helping, but that’s only a ‘maybe’. 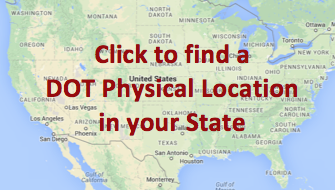 Do you have to get your dot physical in your home state? My husband has kidney stones and when he went for his DOT exam blood showed in the urine and he was given a 3 month certificate and told he had to go see his doctor and be cleared and would have to have a new exam performed when he returns to the medical examiner. Does that sound right? With the new DOT physical starting in two days, these may become the new standard. The CME cannot use the old medical examination forms as of 4-20-16. So he may request a new medical certificate examination in a couple of months. Blood in urine: Follow-up with your primary is normal and the CME is just making sure that all is well before putting a driver back in the seat. Injectable insulin is what the FMCSA is looking at. Oral diabetes medications are fully acceptable, yet will limit your medical card to one year at the time due to diabetes condition. Also make sure you have a medical release form from your treating doctor with your last reports. It helps the CME understand where you are and what your status is. my step son took 1 loritab in oct 2015.in jan this year a drog test by hair.the drug showed up and he failed the test.will this test show up on his dac report? It may, your best bet is to check his record and confirm it. Most times the information only goes to the employer and must be acted upon by them. But check his record to confirm or deny that that is the case. My husband had a TIA 3/2010. The only thing affected was his peripheral vision. He went and got a complete exam within a week following his in-patient stay and the Ophthalmologist signed off that he completely passed the field eye exams and released him back to work. He also takes high blood pressure medication and has for over 20 years. He always passed his DOT physical every year with his blood pressure. In 2014 they said the DOT regulations had changed and he was no longer qualified to a CDL license for 5 years following his stroke. Mind you he had been driving all that time until 2014. The DOT doctor now needed a letter from his Neurologist. His neurologist wouldn’t see him because he wasn’t sick and he released him back to work in 2010. Now it is 2016. He wants to go back over the road and get his CDL license back. What does he need to do to get his CDL license back? And what are the current regulations? In the majority of cases it’s a one year wait. Not because of the TIA, but for the fact that most cases of seizure occur within the first year time frame. You could go get a second opinion from another examiner. And it’s best that you get a medical release form from the neurologist stating that the driver has had no issues with his past condition and is fully release to return to work. I had dot physical 1-21-2016 my blood pressure was 135/81 which is good and has been under control for years by using low dosage blood pressure med. but I was told by the Dr. that I couldn’t have two year certification but a one year. This is the first time this has happen my blood pressure always been under control and have always had a two year certification, what has changed. the Dr said this is the way it has been. FMCSA has it that anyone on medication for the control of high blood pressure can only be certified for one year at the time. Whomever was doing your medical certification before simply did not know the regs. Really not enough information here to try to answer a question. Restless leg syndrome is only one possible symptom of sleep apnea. Try getting a note/medical release form from your doctor with an explanation of the medications that you are taking. As long as you can perform the duties of a CMV operator then there is no issue. Hello. I am asking on behalf of my boyfriend, he has had his CDL for over 20 years and after failing at his extented physical die to his high blood pressure he could lose his CDL. He went to his PCP a month before and his blood pressure was fine. However the first appointment he had with the physical he failed and the doctor gave him an extension and again he also failed, but on the form its due to expire in January of 2016. Now can he go back to have his physical done a third time or has it already cpsted him his CDL? The blood pressure must be below 140/90. If it was higher than that on the first physical reading and he was not on blood pressure medication, he could have received a one year card to get his blood pressure under control. Now if he was given an extension to get it under control and failed again, then he must get his blood pressure under the 140/90. So until he can pass a blood pressure reading below these numbers, whether with or without medications, he will not be able to pass as fit for duty according to the FMCSA. Can your weight alone be a factor for being denied a medical card for a CDL in Texas? No, there is no weight restrictions via FMCSA. It usually has to do with other issues that are connected to excessive weight. And there may be a company policy restriction. Pretty much. If you can support that things are doing fine and your medical doctor will sign a medical release form, then maybe, but don’t count on it. FMCSA has a pretty strict set of guidelines on this one. I am wanting to apply to trucker school to obtain my CDL. I have been taking hydrocodone for Fibromyalgia for 10 plus years, will this be a problem. I do have a physician order for it. You will need to make sure that you have a medical release form from your prescribing doctor explaining your condition and the need for the medications that you are taking. If the CME understands your doctor release then you may get a valid medical card. You will test positive on the drug screen and you will need to have a copy of your prescription available at all times. Let the CME know what and why you are taking the medication, because it will be a big question before you ever get started. I am having an issue getting a response regarding whether I passed or failed a sleep apnea test for my DOT physical. Everytime I call the location that had given me the test, they either don’t call me back or no one answers. Since starting this process(I have not been able to work) this process took 3 times bringing the machine home, they were unable to get a reading then I went to the clinic facilitating test to have an observed test done , this was originally only supposed to take 2 weeks and it is now going on 6 weeks since being on the road. Will you please advise, I can not get intouch with anyone. I am currently seeing my Primary Doctor who was helping me and now his hands are tied. It sounds like you pick a crap company to do your testing. Unfortunately, you need the sleep study information in hand before any CME can issue a new medical card. If there is a parent company to the one you use, then call the main office and request some action. Also let the better business bureau know about the sad service you have received and what it has cost you in time and money. You will need to go through the DOT to acquire a Diabetes waiver to drive interstate. You are not disqualified, but you will have to carry the waiver at all times and your medical card will only be for a year at a time. I have been driving tractor-trailers since 1981 in all 48 and 6 trips up and back on the Alcan Highway. I have never had an accident and only two speeding tickets, 25 something years ago. I am 51 and I have never been denied a medical card. I went for my physical, I stepped on the scale to be weighted and it said 305 lbs. I told the lady that I did not weigh that much, she said “it is what it is”. After a respectable protest I reweighed on another scale and it read 275 lbs., that’s correct. She then checked my blood pressure and she said it was 168/97 with an attitude. My BP has never been that high, and I don’t think it was. I have disc issues in my back and have to take Lortab 10/325, I don’t take them while I driving if I don’t have to but my prescription is for three a day. I have been taking them for 10 years because that it the best balance for pain and not being a vegetable. She said DOT will not allow me to drive while taking Narcotic’s even though it states in the Regs. all you need is a prescribing doctors letter. She also said the prescribing doctor had to be DOT certified, if that was the case I wouldn’t have been there. I quit smoking years ago and told her that, she explained to me because I had smoked I might have asthma/COPD so I will be required to take a Pulmonary Function test that their office will be more than happy to do for a small fee. I was given a Temporarily Disqualified for High PB and Narcotic use. Everything I suggested was stopped short with “The DOT will not do that”, I think the doctors are not following the guidelines and doing what they think should be done. Do I have to go back to the same doctor or can I go to another doctor. I don’t think I’m getting a fair deal. You can go to any nationally registered certified medical examiner you want. If you are taking medications for your back pain, make sure you have a medical release form completed by your prescribing doctor explaining your situation and need for the medications that you are taking. It is going to cause questions and all the CME is looking for is safety issues. So make sure you doctor explains your needs and how you are presently using the medications that you have been on for the past ten years. Drinking a full glass of water is a great idea. I get nervous for lots of things, and I think that water would definitely help calm me down and lower my blood pressure. I also specifically like your comment about talking about something calming or enjoyable. If I talk about something besides a test, before a test, then I’m more likely to do better on that exam. Thanks for your tips.